Here are three Tippett works in classic recordings from 1962-64 as part of the ‘Nipper Collection’. The Concerto for Double String Orchestra and the Corelli Fantasia Concertante are well-loved staples of the English string orchestra library. These are set alongside the John Ogdon recording of the Piano Concerto which is a somewhat less ingratiating work than either of the others. In any event the contrast is welcome. Interesting that shortly after this Colin Davis took his Tippett allegiance to Philips and his recordings there are still seen as classics. There is a price to be paid for the two string works. The performances are full of lustrous deep pile vigour. However time has taken its toll. The edginess of the string sound under strain lends an unwelcome shrillness. This is not an issue in the Adagio cantabile of the Concerto but it can be in the boisterously lyrical dynamic ‘outers’. That said Barshai and his east-meets-west fusion band finds a springy virility in the Concerto for Double String Orchestra although the result remains comparatively dry-eyed. The Allegro molto has a mordant eagerness and bite even if that raging edginess takes some of the gilt off the sound. The Fantasia Concertante is a strange yet enchanting blending of Corellian fantasy and English sentiment. 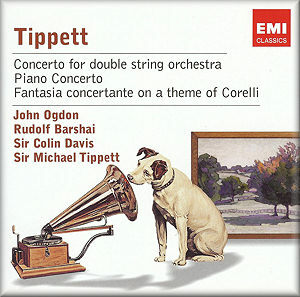 The Corelli is taken by Tippett with the Bath Festival Orchestra alone. The ripieno is by Menuhin, Robert Masters and Derek Simpson (cello). Both works can be heard in better interpretations and in a more richly upholstered perspective by Marriner. The Piano Concerto's mystery is sweetly introduced in a tinkling suggestion of the gamelan then popular with Britten. Soon we learn that the piano must adjust to being swamped by the lumbering orchestra. Yet the soloist's voice can also be heard in a fine and misty filigree of chamber textures at 3:21 in I. Tippett here conjures a triumph of Ravelian deliquescence. There also a touch of Copland sometimes in the athletically sprung writing. This music is full of contrast and gritty interest but that sensuous element familiar from the Double Concerto has begun to disappear and will not return until the very much later works: principally the Triple Concerto and Rose Lake. Neville Marriner's ASMIF recording for Decca, made in 1972, is much better for the two string orchestra works and still sounds pretty good on Decca Eloquence. I wonder if Tippett wrote a better and more life-enhancing work than the Concerto for Double String Orchestra.